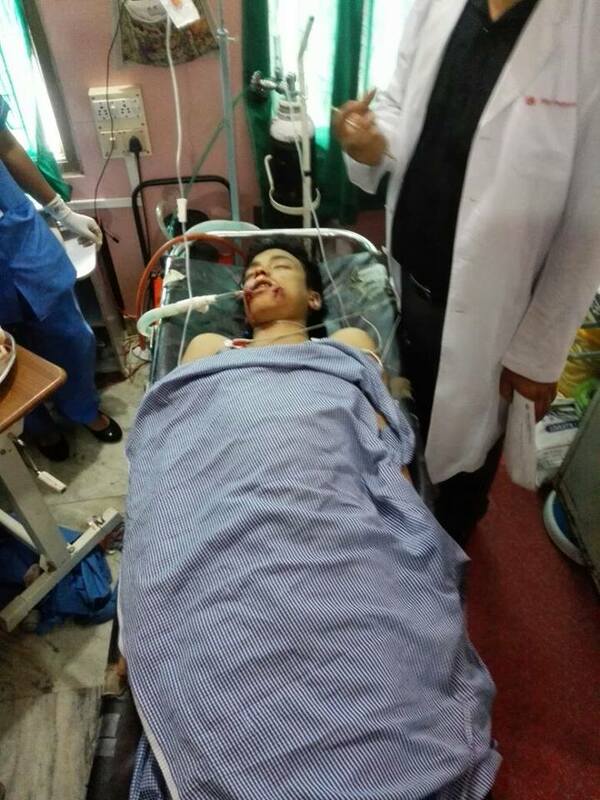 Imphal, 8 July 2015 : Adding a new twist to the ongoing agitation for implementation of the Inner Line Permit System in Manipur, a student volunteer died after sustaining grievous injury during police action in an attempt to contain the agitators who were coming towards the state assembly building with the aim of disrupting and boycotting the ongoing assembly session. The deceased has been identified as Sapam Robinhood Singh, 16, S/o Romesh of Keishamthong Thangjam Leirak, presently residing at his mother’s home at Khurai Lairik Yengbam Leikai and studying in class XI (Science) at Ananda Singh Higher Secondary School, Nongmeibung. He was shot with a tear gas shell on his left check at close range and was rushed to Public Hospital Hatta and was later referred to Raj Medicity, North AOC. The incident happened at Minuthong Hatta when the protestors entered into a clash with the state security personnel who were posted at the area . A large number of students from various educational institutions including Ibotonsana Higher Secondary School, Tamphasana Girls Higher Secondary School , Churachand Higher Secondary School and Modern Academy Higher Secondary School converged from various directions towards the state Assembly building at around 11.40 today morning. A large number of students numbering more than forty also sustained injuries and are undergoing treatment at various hospitals around Imphal. Meanwhile, owing to the deteriorating law and order situation, curfew has been imposed in both Imphal West and Imphal East Districts in an effort to contain the situation and prevent further instances of violence. Meanwhile, at around 10 today morning, a large number of member volunteers of the Women’s Wing, Joint Committee on Inner Line Permit System Manipur (JCILPS) stormed the residence of the state legislative speaker Kh Lokeshwar at Keishampat, Imphal West. The women agitators, when being informed of the unavailability of the speaker decided to wait for his return. In another similar incident, students of CC Higher Secondary School also prevented W.L. Hangshing, Principal Secretary (PHED) from traveling from his official residence at Sanjenthong. The committee has been taking up various forms of agitation in its longstanding demand for implementation of the ILP system which will ensure the protection and preservation of the cultural and traditional identity of the indigenous inhabitants of the state. we sud demand ST .. it will automatically solved everything.. or there any sons and daughter of Arjun.. who consider themselves as Kurus.. ?